Music for Concert Band from Gravel Studios. The five movements of this piece depict five different mythical creatures indigenous to North America: Mothman, Ogopogo, Chupacabra, the Jersey Devil, and Sasquatch. Some of the musical effects used are polytonality, neotonality, fugal and imitative sections, persistant dissonance, and LOTS of percussion. A challenging piece for both the ensemble and the audience. Read more about Cryptids of North America. Night Chorale was written as a warmup for young band in the key of D flat major, to give young musicians experience playing in that key. It consists of a short introduction, a brass chorale, a bridge in B flat minor, and a climax in which the whole band plays the full chorale. Simple and beautiful. Read more about Night Chorale. 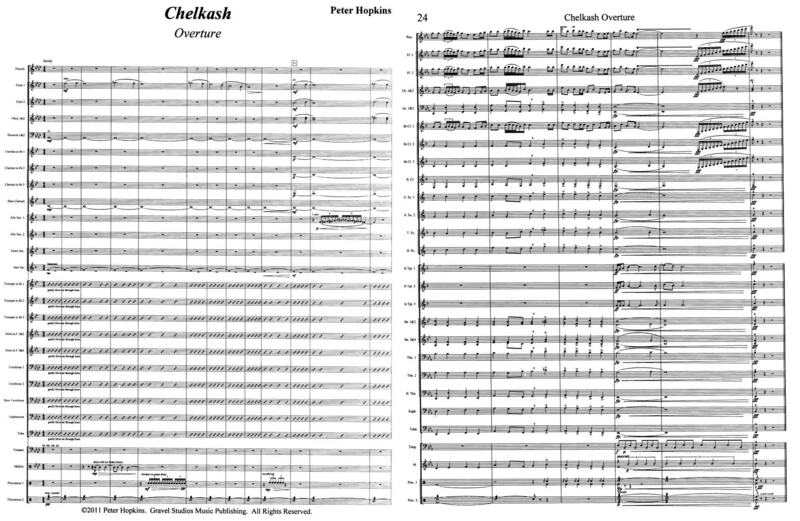 Chelkash Overture is loosely inspired by the short story Chelkash by Russian author Maxim Gorky. 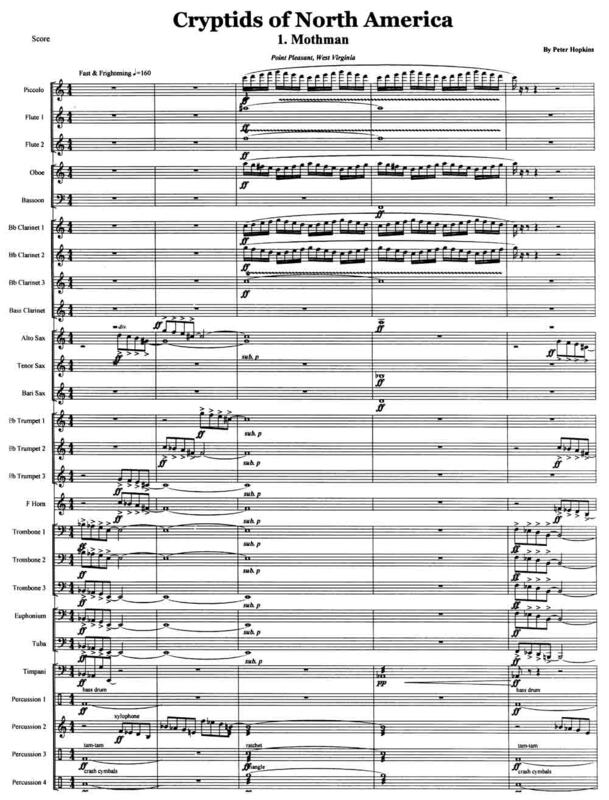 This concert overture contains several themes which are mutated and developed throughout the piece. With solos for flute, alto sax, trumpet, trombone, piccolo, and clarinet, it's a great piece for showcasing your best players (not to mention some killer French horn parts). Look at the first and last pages of the score. Read more about Chelkash Overture. Camptown Races is based on several works by Stephen Foster, with some new material by Peter Hopkins. Each section of the piece represents a different character that might be encountered at a race track, such as the confused newbie, the con man, the high roller, and the drunk. There's also a section in which the members of the band use their instruments to create the background noises someone would hear at a racetrack. Includes solos for tenor sax, piccolo, and oboe (cued in the clarinet part). Read more about Camptown Races. Video Game is composed in the style of classic video game music from the 80's. It has five movements: 1.Title Screen, 2.Run, Jump, Shoot, 3.Love Interest, 4.Final Battle, & 5.The End (Thanks for Playing!). This piece is designed to be easily playable by a good middle-school level ensemble, or by a small band with limited instrumentation. Also includes optional string parts for full orchestra performance. Look at a sample of the score. The Little Band March was composed with, not surprisingly, the little band in mind. It's designed to sound great when played by as few as 11 musicians. Only have one trumpet player? No problem, you only need one. How about just one clarinet? Well, there's just one clarinet part. Don't be fooled, though; this march will sound just as nice played by a band of any size, even a big one. Read more about The Little Band March. March of the Fat Women is a short, raucous, and fun piece that was written and must be played with tongues firmly planted in cheeks. 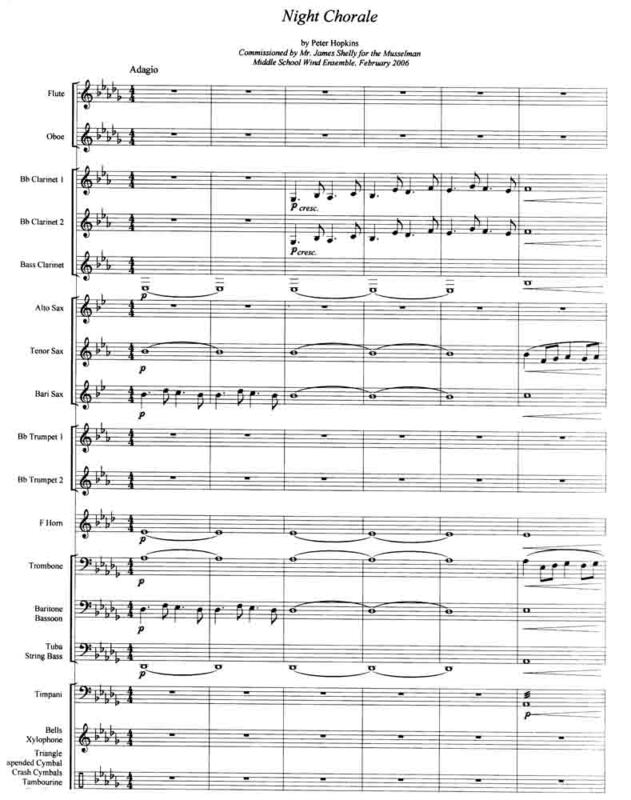 While this piece is most effective with a large orchestra, an abundance of cues make it accessible for almost any ensemble. It would make a fabulous encore, especially if you're looking for a piece the concert band and orchestra can play together. Listen to the original chamber ensemble version. Read more about March of the Fat Women.